Now, here's a blast from the past! 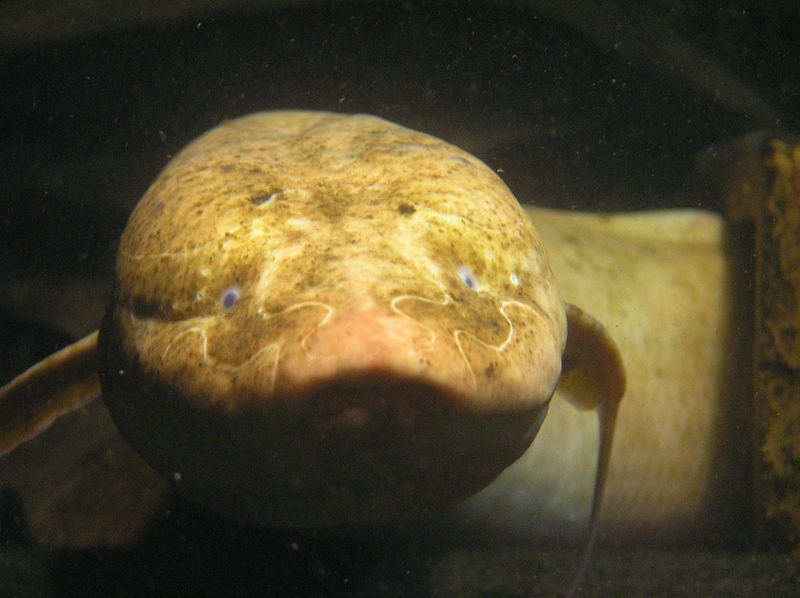 Lungfish are like the last remnants of a once-popular genre of music. There was a time, long ago, when almost every week a new band came out to send thousands of fans all over the world bopping and jiving, waltzing and pogoing to the sound of the times. It was now! It was angry! It was edgy! But then the times change. Bands and personalities disappear. Musical instruments are hung up for good, or at least tuned to a different note. A new generation rises to create sounds of their own and the fresh tunes of old join the fossil record. A few Stones refuse to stop Rolling. They beat back the youth and continue their archaic practises long after the vast majority of their peers have disappeared into obscurity and dignified retirement. They're often called "dinosaurs", but some of them are Lungfish. 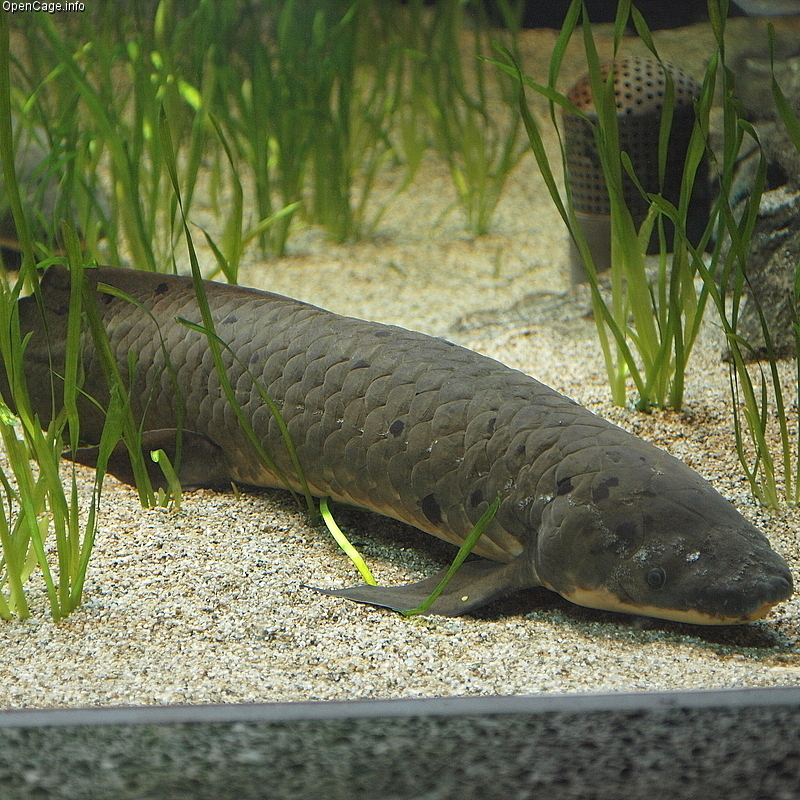 Lungfish are the fish who belong to a subclass called Dipnoi, which means "two lungs"... they have lungs! And gills. They're fish with lungs AND gills! Looks like they had to die for hogging all the equipment if nothing else. Along with the Coelacanths and tetrapods, Lungfish make up the class known as Sarcopterygii, the lobe-finned fish. 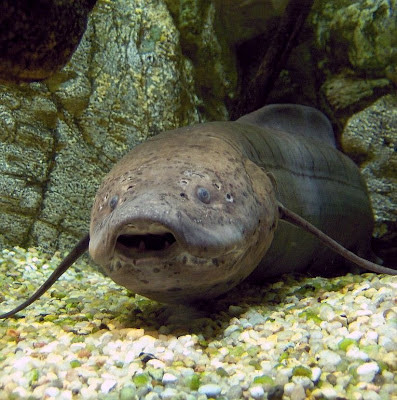 The evidence suggests that Lungfish are the closest living relatives to us tetrapods, Coelacanths being a little more distant. Lungfish evolved some 400 million years ago and flourished, becoming widespread in marine environments. Those were the days! When the world was their oyster, and they held it in the palm of their... fin. But things changed and the newfangled ray-finned fish pushed the Lungfish from the sea and watched their near total demise. Hopefully the Lungfish were philosophical about the whole thing... especially since they themselves helped wipe out the once dominant jawless fish, leaving nothing but the Lamprey in their biting, chewing wake. Pah! Life is almost as ruthless as the music business sometimes! Today, there are just six Lungfish left. Their odd, widely separated distribution in Australia, South America and Africa seems to be a testament to the history of their rise and fall. They all retain that old lung that gives them their name and allows them to breathe air in the slow-moving rivers they call home. Being lobe-finned fish they also have fleshy fins full of muscle and bone which are attached to the rest of the body by a single joint. This arrangement is akin to the arm or leg of a tetrapod, and quite unlike the large number of fin rays other fish use as attachments. Lungfish have tiny, googly eyes which look like they were just stuck on, Sesame Street style. With such puny peepers they probably get a lot of use out of their electrosensory abilities, as well as touch and smell to find tasty prey like fish, crabs, snails and just about anything else it comes across, including plants and fruit. Lungfish teeth are utterly unique! They start off sharp and cone-shaped but as the Lungfish grows, the teeth expand, get a little blunt and become a tooth plate for crushing their food. They're strongly attached to the skull and never fall out. The Lungfish subclass, Dipnoi, is split into two orders. One is called Ceratodontiformes and contains just one species, the Queensland Lungfish. It can reach well over a metre (3.3 feet) long and is noticeably different from the other Lungfish since it has large scales and its pelvic and pectoral fins are leaf-shaped. It's different on the inside, too. The Queensland Lungfish has great gills that can usually be relied upon to take in all the oxygen they need. They have just one lung for breathing air so they can survive out of water for several days so long as they don't completely dry out. Of all the living Lungfish the Queensland Lungfish is the one which most closely resembles their ancient relatives. Indeed, fossils show that this particular species has barely changed at all in over 100 million years! We all know rock bands like that, don't we? The other 5 Lungfish all belong to the order Lepidosireniformes. They have much smaller scales and their fins are weird thread-shaped things, almost like tentacles. They even use them to sort of "walk" across the riverbed! It's less like a fish and more like a monstrous... thing. With tentacles! Their gills are a bit rubbish so that they need to breathe air even at the best of times, which is OK since they have two lungs instead of just one. Check out that weird walking action! These Lungfish are further split into another two groups. One contains the South American Lungfish, which inhabits the Amazon and Paraná River. They can reach 1.25 metres (4 feet) long and because of their handy lungs, can aestivate, which is like hibernating except you do it when it's hot and dry instead of when it's cold. When the water dries up, they dig more than 30 cm (a foot) underground and slow their metabolism to conserve energy. Mucus is used to seal the moisture in and a few holes are left to let in air. 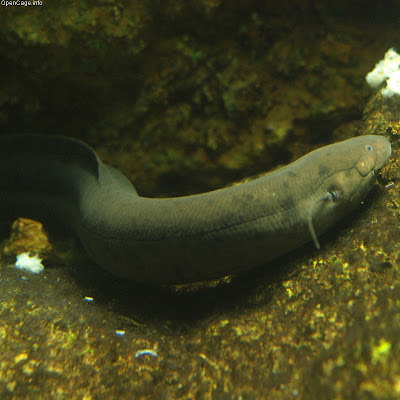 The other four Lungfish are the African ones. They include the Gilled African Lungfish, which is the smallest of them all at a meagre 45 cm (18 in) long. 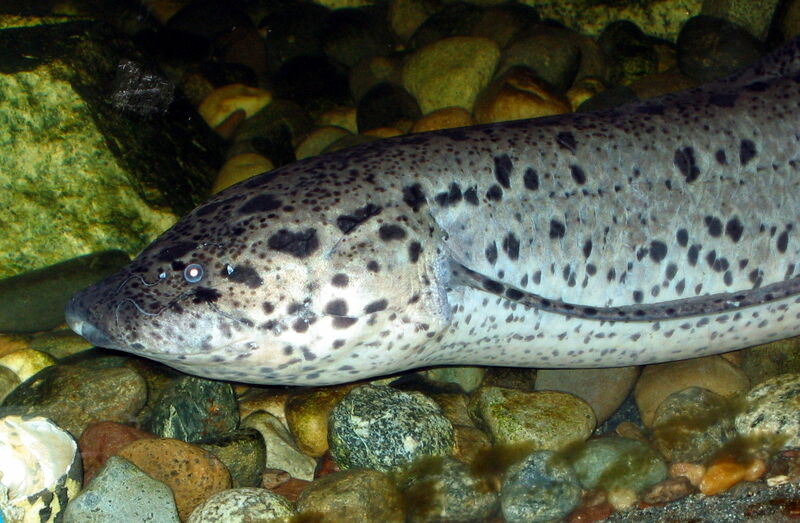 Then there's the Marbled Lungfish, the biggest at up to 2 metres (6 foot 8 in) long. This is a tall-man-sized fish! Not like that disappointing "man size" tissue paper. 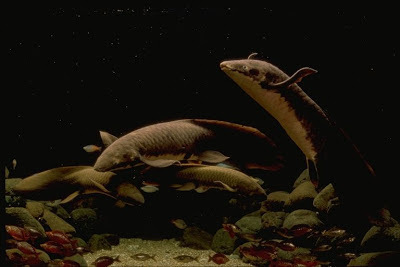 These are the Lungfish that aestivate like a champ. After burrowing underground, they secrete mucus all over their body. They positively BATHE in the stuff! And then it all dries up to form a cocoon. 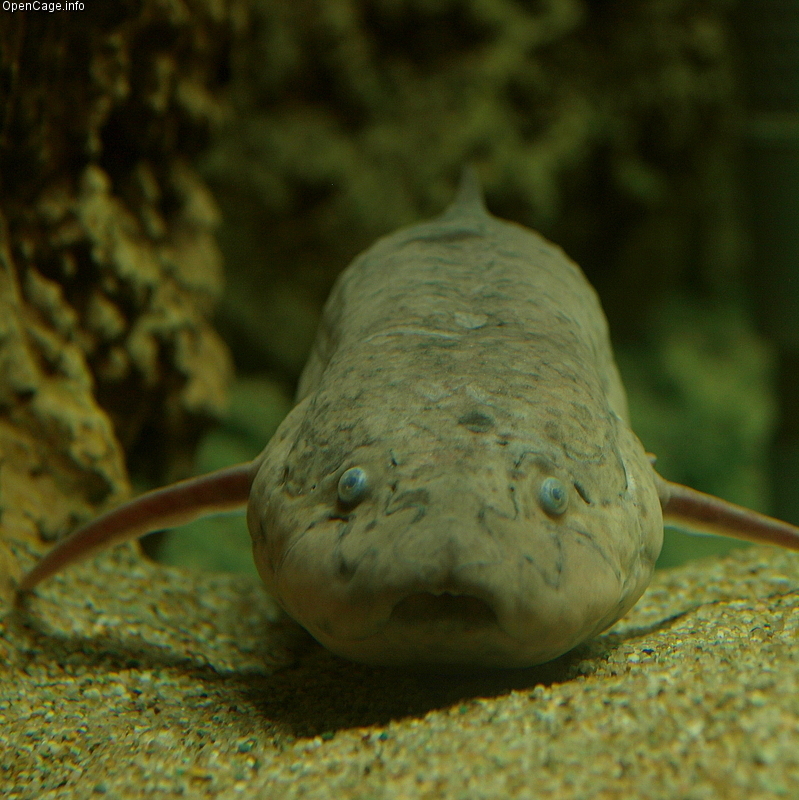 Now, even when the surrounding mud completely dries up, the Lungfish can sleep, awaiting the return of the rains. They can stay like this for years if they need to! The rain dissolves their mucus cocoon, too, so they don't even need man size tissue paper. African and South American Lungfish also use their burrow-building skills when it's time to spawn. They lay their eggs in there and guard them against predators. 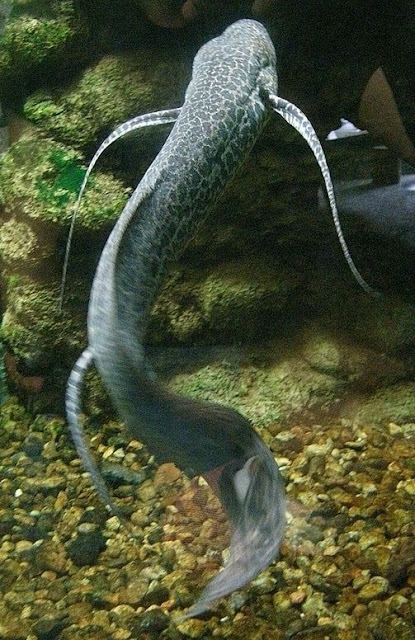 The male South American Lungfish even grows strange, blood-filled filaments on his pelvic fins which are thought to help him keep the eggs well oxygenated. 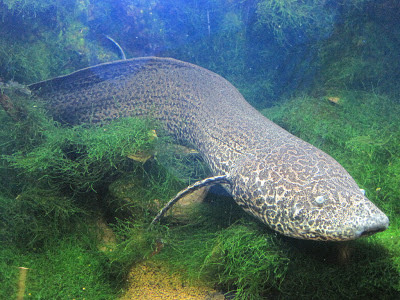 The Queensland Lungfish doesn't bother with any of that, they just deposit their eggs among vegetation. The young grow very slowly, some Queensland Lungfish took almost 4 months to reach 2.5 cm (an inch) long, but at least they can look forward to long life of several decades. One interesting fact is that baby African and South American Lungfish have external gills! They look like Axolotls busily regrowing their limbs after an accident rendered hilarious by the fact that they can regrow their limbs. They're not Axolotls, though. And they can't regrow their lobe-limbs, either. So long as they avoid the loss of body parts, they should have a reasonable chance of becoming a great, big weirdo fish with gills AND lungs, just like their parents. Sometimes the old tunes are the best. they vary between beautiful and cute! and how cool that they can breathe air and cocoon, too! Another informative and enjoyable read. I love learning about this stuff, and you guys make it so I can actually read through the whole thing without dozing off. Ha! Well I'm glad I'm not making you fall asleep!